"The perfect example of this type of spiritual and apostolic life is the most Blessed Virgin Mary, Queen of Apostles, who while leading the life common to all here on earth, one filled with family concerns and labors, was always intimately united with her Son and in an entirely unique way cooperated in the work of the Savior. Having now been assumed into heaven, with her maternal charity she cares for these brothers of her Son who are still on their earthly pilgrimage and remain involved in dangers and difficulties until they are led into the happy fatherland. All should devoutly venerate her and commend their life and apostolate to her maternal care." 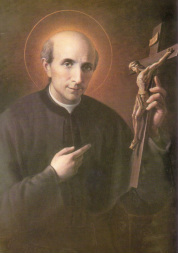 Saint Vincent Pallotti was born in Rome in 1795. From the time of his childhood, he offered his resources and his life to the service of all. He was a well-known priest in Rome because many people sensed that God worked extraordinary graces through him. In his lifetime, he founded the Union of Catholic Apostolate, an association to revive faith and rekindle charity among Catholics and propagate the faith to all. At that time, the laity was not actively involved in the mission of the church. Saint Vincent wanted to inspire people of all walks of life to work constantly for God's kingdom. Truly radical for his time, Saint Vincent was known for approaching the "faithful of every class, rank, and condition" to minister to "those who are most spiritually needy." He sought people to treat those in need "with care and with a loving and tender concern." He called the members of the Union of Catholic Apostolate, laity, sisters, priests, and brothers, to charity, patience, humility, zeal, and love of God. He died in 1850, leaving a legacy that continues to inspire people worldwide. St. Vincent Pallotti was canonized by Blessed John XXIII on January 20, 1963, just after the close of the first session of the Second Vatican Council. His feast day is January 22nd. Visit our Pallotti Portal for more information about St. Vincent Pallotti and his charism.